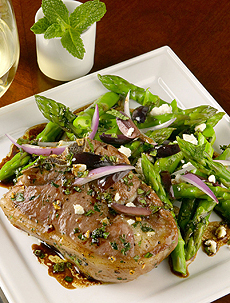 This Warm Salad Of Asparagus Spears & Seared Lamb Chops With Fresh Mint Vinaigrette is a sure crowd-pleaser. Photo courtesy California Asparagus Commission. Lamb chops with mint jelly is a classic, but how about lamb shops with mint vinaigrette? Add asparagus—one of the favorite vegetables to pair with lamb—and you’ve got a hit! This is Page 9 of a 12-page article. Jump to the recipe. Click the black links below to view the other pages. Season the chops with salt, pepper, garlic and oregano. Heat a heavy skillet over high heat. Add 1 tablespoon oil. Sear each side of the chops for 3-4 minutes for medium rare. Remove chops from pan. Set aside. Cover loosely to keep warm. Pour off any fat left in skillet while keeping lamb juices in the pan. Add stock and scrape up any brown bits from the pan. Boil until the liquid reduces to 1-2 tablespoons. Remove the pan from the heat and add the vinegar. Whisk in the remaining 3 tablespoons olive oil. Add chopped mint. Season with salt and pepper. Set aside. Cut asparagus into 3-inch spears. Steam until tender. Arrange warm asparagus and lamb on serving plate. Pour warm vinaigrette all over. Top with feta, onions and olives. Serve immediately.